A simple streetcar transfer with a schematic map, patented in 1916, introduces the book. This example shows how claims describing the breadth of the patentee’s monopoly supplements the specification describing how an invention works. The patent system and conventional refereed journals are parallel literatures, similar in several ways, including careful vetting by patent examiners or journal editors. Minimal cross-referencing between the two literatures reflects separate networks of creative people who differ markedly in work environment and sense of problem. 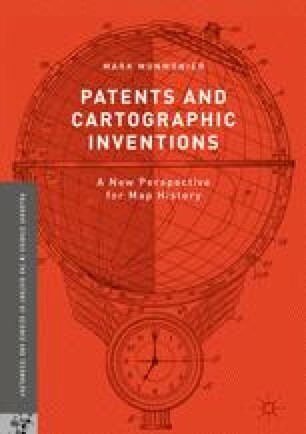 The chapter also notes the importance of the US Patent Classification system, used by examiners to find potentially conflicting inventions; the marked historical dissimilarity of trends in cartographic patents and patents in general; and the relevance of social science principles like the Theory of Multiples.